Getting started with new technology can sometimes be complex and time consuming. Often it requires searching for the right getting started and operational guidance that include samples and posting questions on forums. We at Azure Storage continue to strive to improve our end-user experiences to make it easy for you to discover and try out a sample in just 5 minutes. As part of this, we want to make our samples more easily discoverable, fully functional and community-friendly. 1. 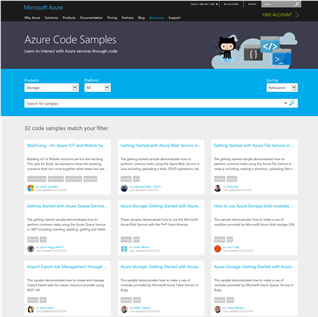 Discoverable: We now have a landing page with all the Azure Storage samples listed with per language GitHub repos. You can download the zip project file or fork the sample repo that you are interested in. Most of our Storage content pages either are already updated with or will be updated with relevant sample page links for you to easily pick up the sample, compile and experiment with. 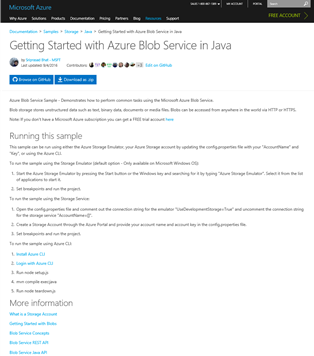 Beyond specifying either using the emulator or connecting to an Azure Storage account with your credentials, the code should just work. 2. 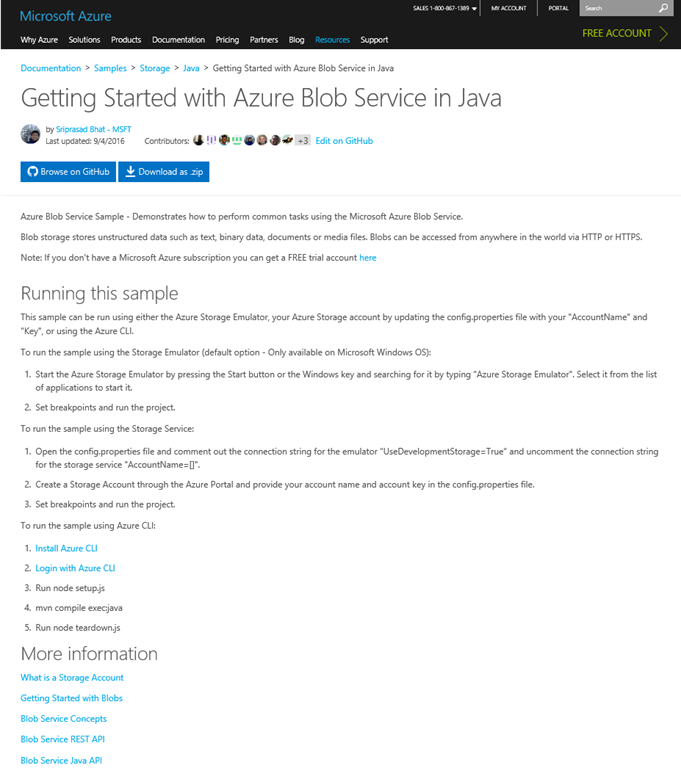 Relevant: In the samples page (image on right), we initially focused on functional code samples for the most common Azure Storage usage scenarios for Blobs, Tables, Queues, and Files written in .NET, Java, Node.js, Python, C++, Ruby and PHP. These are already available for you to use right away! Similarly, we have invested in functional samples in scripting /tooling options (Powershell, AzureCLI). Following this, we plan to invest in creating a few scenario samples like data movement solutions, image upload from a mobile device, designing for high availability, client side encryption working across OS platforms and languages that light up the rich service and client library capabilities on Storage and at the same time showcase patterns and best practices. Also, as we build new features, we will do our best to keep these up to date so you can see your favorite new features in action. 3. Open Source: Finally, the code is open source and is readily usable from GitHub to make it possible for community contributions to the samples repository. Simply propose your change and we will review the design and code then merge it in. You can help build new samples or keep these samples up to date as the client libraries and the service evolves. As always, we are interested in your feedback so please let us know what you think by providing comments on this post. 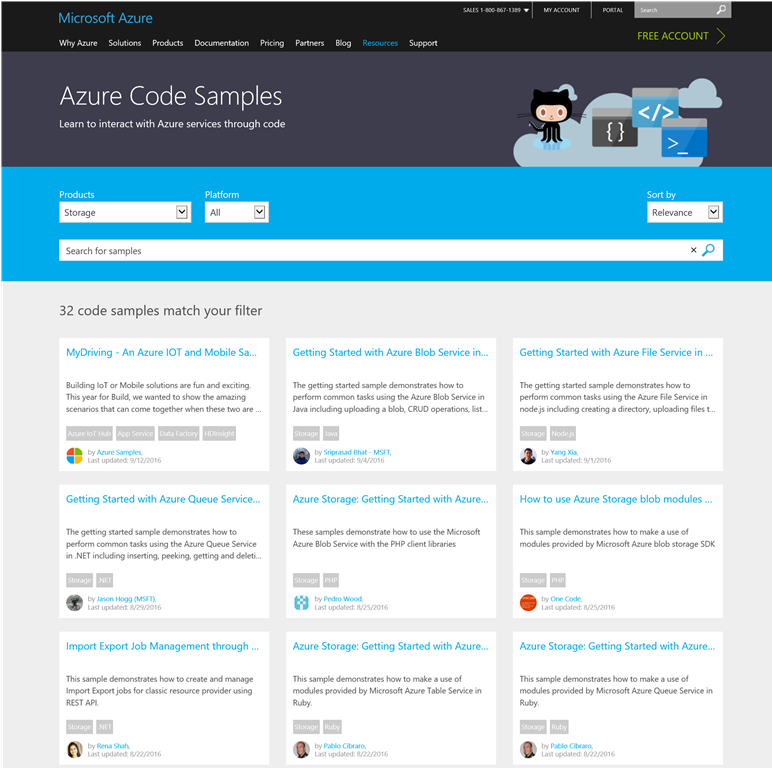 As you start leveraging individual samples, please provide actionable feedback in the GitHub repo and/or the comments in the azure storage documentation web page. Go ahead, navigate to the Storage samples page, get started with the samples and explore how easy it is to build cloud applications on Storage!